Shrinidhi S Surgond of grade 7 of KLE’s CBSE School, Haveri, secured 1st place in 1500 mt running in the CBSE National ATHLETICS Meet 2014-15 which was held at Divine Child School Mehnasa, Gujarat from 8th January to 12th January 2015. She clocked 5 min 23 seconds to cover the 1500 mt running which is commandable. 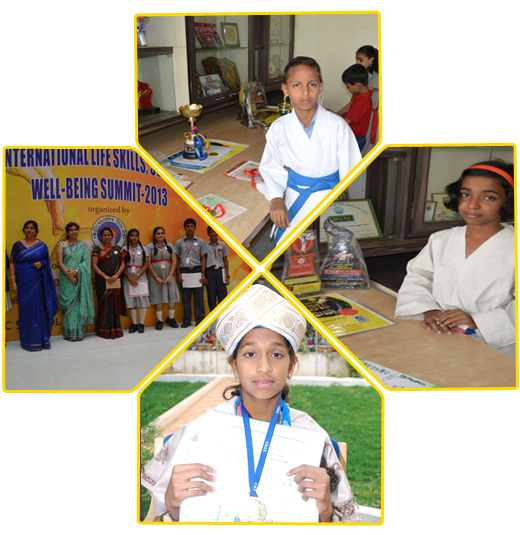 22nd and 23rd-- CBSE 3rd International Life Skills, Values, Gender, School Health & Wellbeing Summit 2014. CBSE 3rd International Life Skills, Values, Gender, School Health & Wellbeing Summit 2014 was held on 22nd and 23rd of November at Pune. Delhi Public School, Pune hosted the programme. Our school students Master. Pranav H, Master. Chetan R, Miss. Veerlakshmi H and Miss. Disha B participated in the summit. Our school secured 2nd place in “Global School Health Exhibition” and 2nd place in Theme Song on “Gender and Values” and consolation prize for Thematic Jingle on “Diversity of India- My-Pride”. 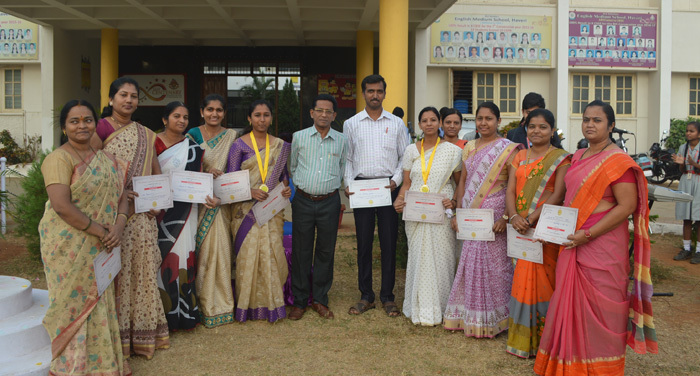 Teachers Mrs. Dayavati Murnal and Mr. Shravan Kulkarni attended the summit with the students. 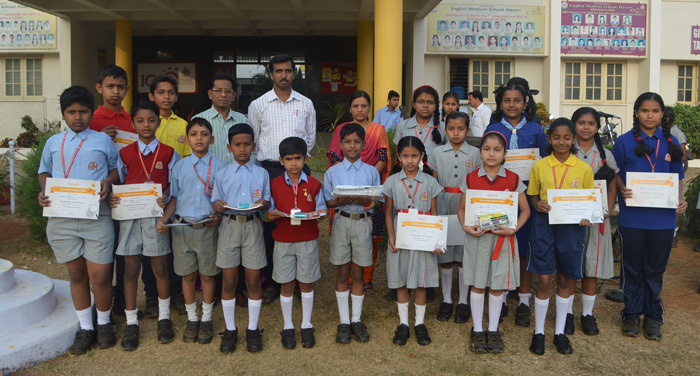 Master Pavan Hegde and Master Krintanjay Srivastav were awarded cash prize of Rs. 5000/- under Inspired Award Scheme. Putani Vigana( Science Talent Exam ) exam was conducted on 14th Sep 2013 from grade IV to VII 86 students attended the exam got hundred percent result and 2 students Miss. Neharika R. Munjoji of grade VII and Miss. Tejaswini Madyal of grade VI stood 4th in the National level. Miss. Lavanya L. Laroshi of grade 5 stood 3rd for the state level. Miss. Shreekakshmi S. Kelaginmani, Miss. Shreya Bistannavar of grade VI and Master. 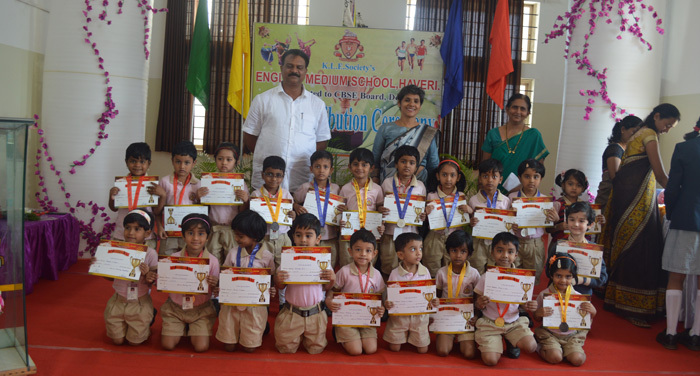 Sumanth Mardi of grade VII stood 2nd in the District level. Miss. Sahana Mudagal of grade VI and Miss. Arunima Srivatsav of grade V stood 3rd in the Taluka level and have brought glory to the school. National Schools Computer Science, Delhi conducted exam on computer on 1st March 2013, 179 students from grade III to VIII attended the exam Miss. 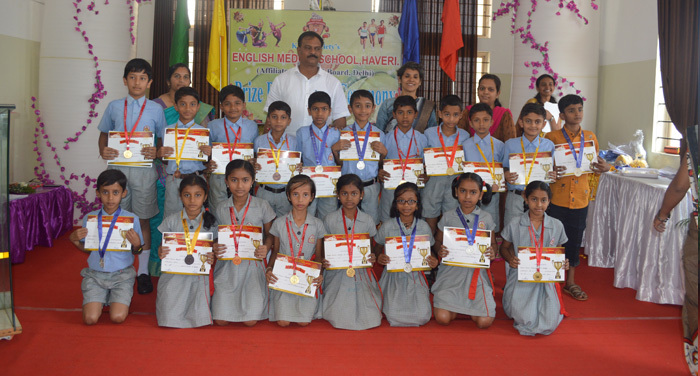 Sahana S. Mudagal of grade VI won gold medal by securing highest percentage and Master Srijan Naik of grade IX won silver medal by securing second highest percentage to the school. Rural IT Quiz was conducted on 8th Oct 2013 our students Miss. Akshata and Sushmita of grade X were qualified for the Division level and gave a tough competition to all the participants. Kalashree Innovative Science: competitions were organized by Kalshri Aike Shibira 2013-14 in which Miss. 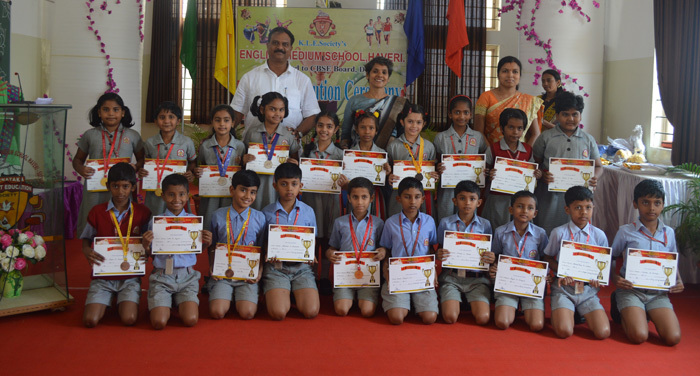 Akshatha B. Patil of grade X secured 1st place in science Experiment and Master Kiran S. Sarvand of grade X secured 3rd place in the Science Experiment. Master Vinay Ambiger of grade secured 1st prize in Essay Writing competition. Miss. Akshata Patil of grade X got 3rd place in District level science experiment. Karnataka State Pollution Control Board on account of World Environment Day conducted Essay Writing and Drawing competition on 16th Sep 2013 in which our students Sushmita R. J of Grade X secured I in essay and Miss Madhu V. J of grade VIII secured III place in essay writing. Miss. Rachana S. J of grade X secured I place in Drawing competition. 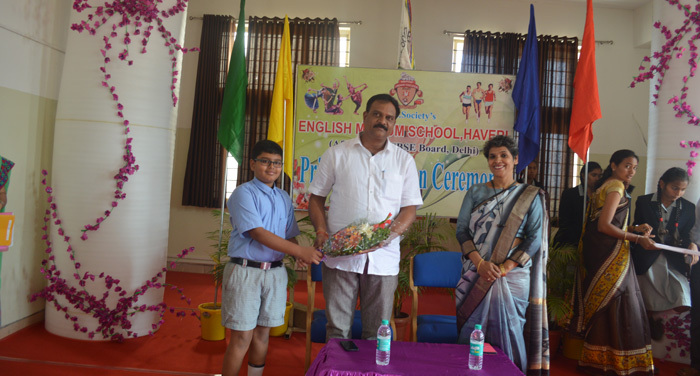 Master Karthik M. Sannaningannavar of grade IX and Master Bharat Bennur of Grade X attended the quiz programme oraganized by North Karnataka Sahodaya at Royal Palace School Jamakhandi on 12th Sep 2013 brought laurel to the school. 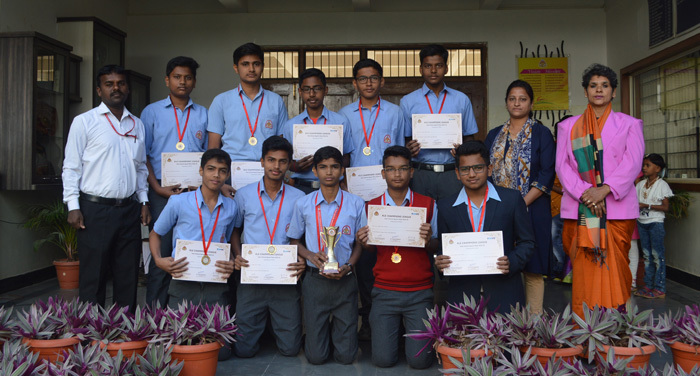 Master Karthik M. S of grade IX, Master Shashank Hiremath of grade IX, Master Bharath S. B of grade X and Master Prajwal Haveri of grade X attended the quiz competition held at KLE School Ankali and have brought credit to the school by qualifying among top 4. 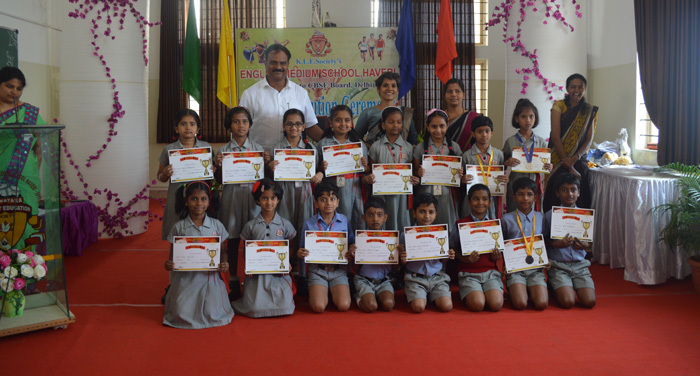 Students have participated in various sports organized by CBSE Cluster VII : Master Anand Melmuri of grade IX participated in Skating Championship 2013 held on 17th to 2nd Oct 2013 at KLE International School, Belgaum . CBSE Cluster VII Athletics Meet 2013 was held at Smt. 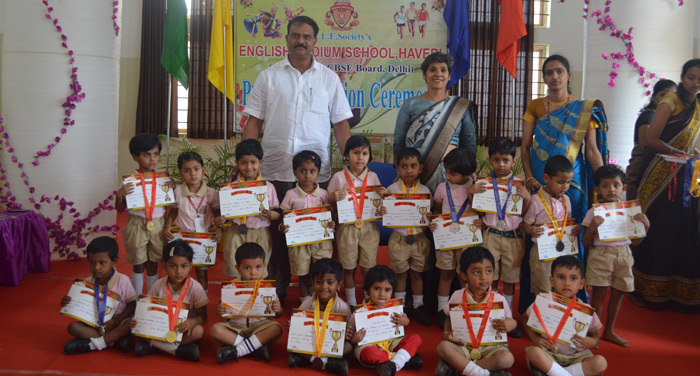 P. S. Shivashankarappa English Medium School Tolahunse, Davangeri from 8th to 10th Nov 2013, 18 students participated and Kumari Shrinidhi S. Surgond secured 2nd place in 1500 mts running and qualified for the CBSE National Level Athletics Meet at Vanaransi UttarPradesh, and has brought credit by being one among the top 5. CBSE North Karnataka Sahodaya Interschool Chess Championshiop 2013 was held at Shree Shankarling Model School Chikkalgud Dist. Belgaum on 10th Nov 2013. Miss. Manisha C. Jain of grade VIII secured 1st place in chess in the under 16 years category. Karnataka Hand Ball Association had conducted coaching camp for the state sub junior girls for under 15 years and mini boys for under 12 years at Shivamoga. Miss. Veeralaxmi U. Hiremath and Master Shreyas P. Doddamani were selected to the state hand ball team and were qualified for the National Level played at Chennai from 24th Sep to 29th Sep 2013. CBSE 2nd International Life Skills, Values, Gender, School Health and Wellbeing Summit- 2013 was held at Regional level on 9th and 10th of Nov 2013. Miss. Roma .S. Pandit, Miss. Naziya Devihosur of grade X and Master Prajawal J. Chennashetty of grade IX and Master Anand Melmuri of grade 9 praticpated in it and won prizes in Theme song, Jingles and Stall etc. 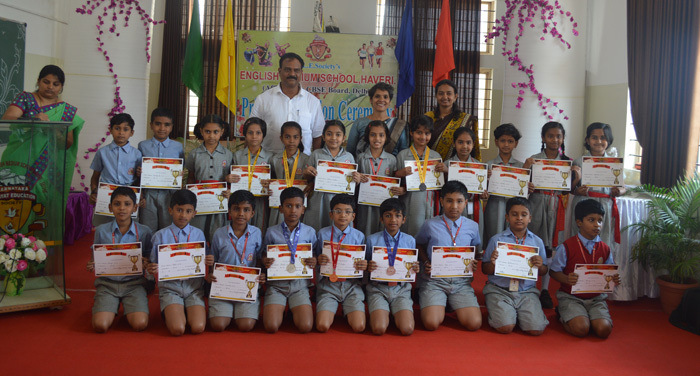 International Summit was held at Delhi from 16th to 18th Dec the same team represented KLE Haveri and brought the meritorious award to the school. International Summit : 1st International Life Skills, Values, Gender, School, Health & Wellbeing Summit 2013, Pune. 2nd International Life Skills, Values, Gender, School, Health & Wellbeing Summit 2013, Delhi.